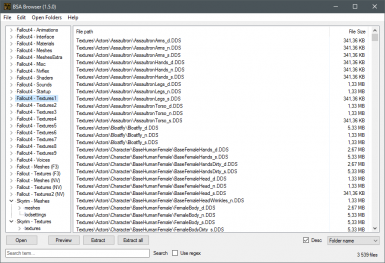 Updated BSA Browser from Fallout Mod Manager with support for BA2 archives. BSA Browser is an application to open and extract files from .BSA and .BA2 archives. This was forked from Fallout Mod Manager's built-in BSA Browser. It was originally only for .BSA files hence the name BSA Browser. However it's been updated it to support .BA2 files as well. Use the provided installer or portable version, which you just extract & run.